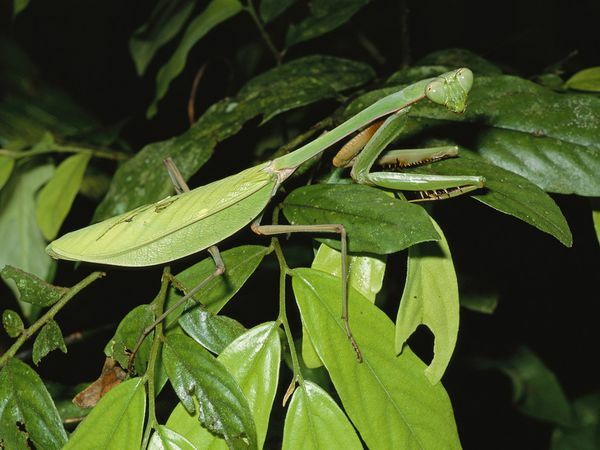 The praying mantis gets its name due to the prominent front legs. They are often bent and held at an angle, which suggests the position of prayer. The larger group of these insects is known as praying mantids. Mantis indicated the genus, mantis. Only a few praying mantids belong to these genus. Irrespective of the name, these insects are wonderful predators. Their head are triangular and situated on a long ‘neck’ or extended thorax. Mantids have the ability to turn their heads 180 degrees. They are able to scan their surroundings with the help of two large compound eyes. They are green or brown in color. They are well camouflaged on the plants on which they live. Mantids are known for their ambushes. They patiently stalk their prey. They utilize their fore legs to snare their prey with quick reflexes. The reflexes are so quick, they cannot be perceived by the naked eye. Their legs are well equipped with spikes in order to snare prey and pin it in place. Mantids gorge on moths, crickets, grasshoppers, flies, and other insects. Mantids also eat other fellow mantids. Their mating behavior throws up an amazing spectacle. Female mantids are known to consume the male counterpart immediately after mating. She may eat the male even during mating. This, however, does not dissuade males from reproduction. Females are known to lay hundreds of eggs in a small case. The young ones, or nymphs, hatch, resembling miniature versions of their parents.